Viviparous Dumpling is another excellent creation from the minds of both Edmund Mcmillen and Caulder Bradford. 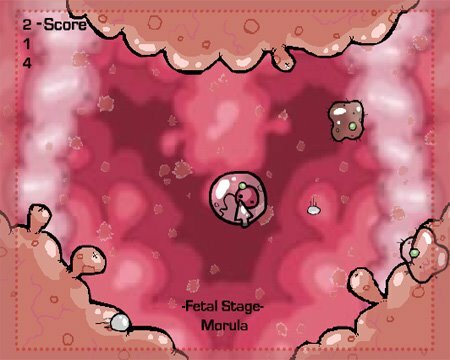 Guide the fetus around parasites using the mouse, while trying to gobble up sperms and white pills which heal the main character. The damage you've taken from colliding with toxoplasms are indicated by the green dots. The game ends immediately if you accumulate more than three of these. Press the enter key to pause the game. Simple but rather addictive, owing much to Ed's quirky sprite designs.